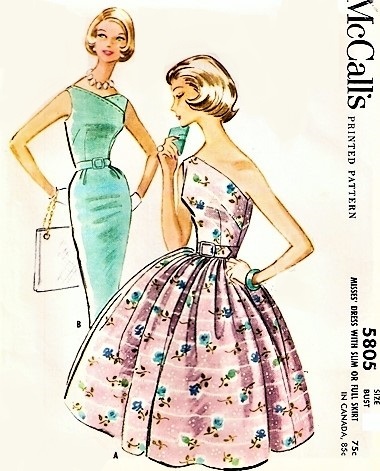 McCall's 5805; ©1961; Misses' Dress with Slim or Full Skirt. Dress with dart fitted bodice and three-gore slim skirt or one-piece gathered skirt. 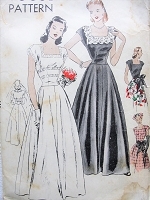 With full skirts, upper left bodice back and front are omitted and dress is suitable for plain or bordered fabric. Slim skirt has folds at side front, darts and low pleat at back. Either dress has left side zipper closing. Decorative stitching outlines neck of slim dress.